Keeping painted cabinets fresh and clean is something that should be a priority. If you want your cabinets to maintain their beauty and radiance for a long time, then you need to take proper care of them, zero exceptions. Kitchens aren’t exactly the tidiest parts of the home. That’s not exactly groundbreaking news, either. Food preparation can lead to all sorts of messes. That’s the reason it’s so critical to maintain clean cabinets. It’s particularly critical for those that are painted. The last thing you want is for your formerly flawless painted cabinet to develop unsightly and conspicuous chipping, blistering and peeling paint, after all. If you’re serious about steering clear of paint harm, then you need to stay away from techniques that are aggressive in any way. Don’t use equipment or solutions that are abrasive. Aggressive formulas can lead to significant paint discoloration. They can lead to fading as well. Don’t go anywhere near products are highly acidic or alkaline. Don’t make the mistake of assuming that the most elaborate or complicated technique will necessarily be the most effective one. It can sometimes be wise to stick to the basics. Go easy on your cabinets. Massage them thoroughly with the assistance of a smooth and moist cloth. This should rid your cabinets of any lingering debris, dirt, grime and dust. This shouldn’t take up a lot of your time, either. Don’t fret if your previous basic cabinet wiping attempt wasn’t a total success story. Getting rid of oil and dirt accumulation can sometimes be a bit more challenging. You can move on by blending warm H20 and detergent together. You don’t have to be too precise with your amounts, either. You simply need a level of detergent that can produce suds. Immerse a cloth that’s made out of microfiber into the aforementioned suds. Squeeze it. Massage the lightly wet cloth directly onto your cabinets. Do so in a circular manner. Continue to do so until you don’t see any remnants of dirt whatsoever. Retrieve another cloth. Use water that’s devoid of soap to moisten it. Massage the cabinet in the same exact circular manner. Do away with any and all hints of soap. Get yet another cloth and thoroughly dry the cabinet. Employ the same circular approach. Don’t panic if you have any particularly persistent greasy areas that just don’t seem to go away no matter what you do. This hassle-free technique can work well. Simply mix a single baking soda tablespoon, a couple cups of warm H20 and a sole cup of vinegar. Immerse a cloth into the blend. Then get to work on these persistent and frustrating sections. Once you’re finished, you can dry all of these sections. 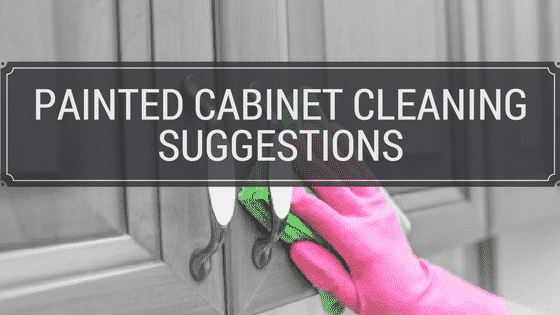 There’s another method that can work like a charm on greasy sections of cabinets, too. Blend together the same amounts of both warm water and vinegar. Put the mixture inside of a spray bottle. Spritz it straight onto the oily areas. Allow it to stay there for a total of five minutes or so. Once five minutes has passed, you’re totally ready to wipe it off. Voila! You’ve managed to clean your painted cabinets like a true expert. If you’re interested in first-class professional painting service, reach out to Xpert Custom Painting as soon as you can. Be sure to check out our social media presences right now. We can provide you with professional painting work that’s reliable and detailed. Our painters are hard-working, experienced and dedicated professionals who strive to please time and time again. They paint all kinds of surfaces as well. When you need immaculate and meticulous paint service for kitchen or bathroom cabinets, you can give us your full attention. Get in contact with us today.